The World in My Kitchen: Beet Risotto: Kid and Adult Friendly! 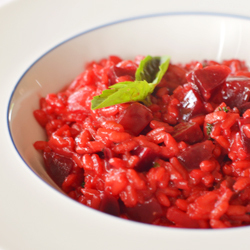 Beet Risotto: Kid and Adult Friendly! So when we got beets a couple of weeks ago from our CSA, she did a happy dance. She's happy to eat them roasted and plain or in a salad, but I wanted something a little different. And then I stumbled across this recipe on Tastespotting. The vibrant color mesmerized me, and when I was able to shake the stupor off, I realized that I had every ingredient I needed already in my kitchen! It's an incredibly easy recipe, and my daughter oohed and aahed over the brilliant ruby color. This is one way to get your kids to eat their veggies and enjoy them for yourself too! I halved the recipe since it was only my daughter and I, and there wasn't a morsel left. (The recipe below is the original amount.) 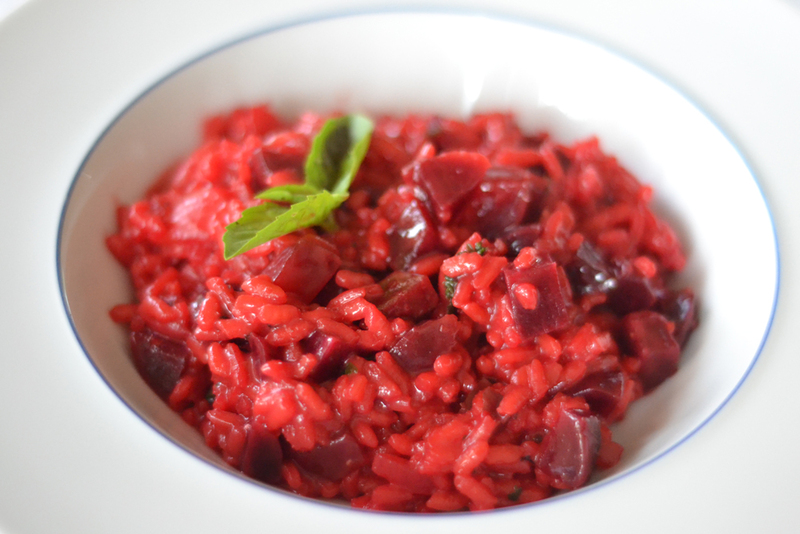 I also roasted the beets a couple of days before, which saved a ton of time when it came to making the risotto. Preheat the oven to 400 degrees F. Place the beets in a small baking dish and lightly drizzle with olive oil. Roll the beets around until they are completely coated in oil. Cover tightly with foil. Roast for about 20 minutes or until they are easily pierced with a fork. Remove from the oven and cool completely. Peel the beets--the skins should slide off easily. Dice. Place the chicken stock in a saucepan and bring to a simmer. Reduce the heat to low. In a large, heavy-bottomed pan, heat the 2 tablespoons of oil over medium heat. Add the onions and stir occasionally until the onion soften, about 3 minutes. Add the rice and garlic, stirring constantly until the rice is completely covered in oil and starts to crackle, about 3 minutes. Add the wine and stir constantly until the wine has been almost completely absorbed. Add a ladleful of stock and continue to stir until it has been almost completely absorbed. Add another ladleful, and continue doing this for about 10 minutes. Stir in the diced beets. Add more stock, and continue as before for another 10-15 minutes or until the rice is finished. The rice should not be mushy, but should also not be hard in the middle. When the rice is finished, add the Parmesan cheese and parsley. Season with salt and pepper. The rice should be creamy--if not, add another ladleful of stock. I'm still trying to get Andy to try to like beets. I've tried hiding them, roasting them, frying them - but never putting them in a risotto. Think this might be what will win him over - if not, I know I'll love it! Sounds great! 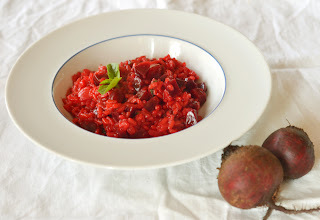 Mindy, love your post and your blog...beets are great veggy. An easy task to Store. Downwards Attempting to sleep purses will be much better to cartier replica sale as opposed to people that have man made fills. They've been further squeezed. You can actually recede these products closely not to mention fit in these products towards the knapsack, going out of further location for the purpose of stuff prefer food stuff not to mention shirts or dresses. That will get a make your way way more pleasant, for the reason that hublot replica sale does not only enable you draw some reduced bulky store, it will also can help you draw further qualities for a trip. Shoe pouch can be described as containers which may be would always stow shoe. It happens to be manageable not to mention basic turn out to be had near. It again is constructed from rolex replica, clothes and / or leatherette. Shoe purses supply safer destination for a save your shoe. You can find shoe purses that you can choose between, this unique can include labels prefer Transpack shoe pouch not to mention Dakine shoe pouch. Let's consider Total Tools in Shoe Pouch? Shoe cartier replica are generally foldable not to mention held on to conveniently subsequent to chosen. It happens to be hooked up with the help of take on as well as good sized cupboard space if you want to save your shoe, shoe care and attention device not to mention socks. Virtually all shoe purses are actually the water data and so acceptable for moistened time of day rolex replica. Ordinarily, factors behind shoe purses that anyone can check out are actually snowboarding shoe purses. Consider Shoe Pouch. Consider Shoe Pouch specify hold personal training outstanding styles of purses.